This is a pretty quick and easy meal to rustle up, particularly if you’ve got little children whose hands are the perfect size for rolling the little croquettes – a posh name for fish balls basically. It’s also quick and easy if, like me, you cheat and buy a ready-made hollandaise sauce, rather than making your own from scratch. Clearly homemade hollandaise is what we should all aspire to, but when you’re working full-time like I am at the moment, it’s just not always possible. And there are some rather nice shop-bought ones around. 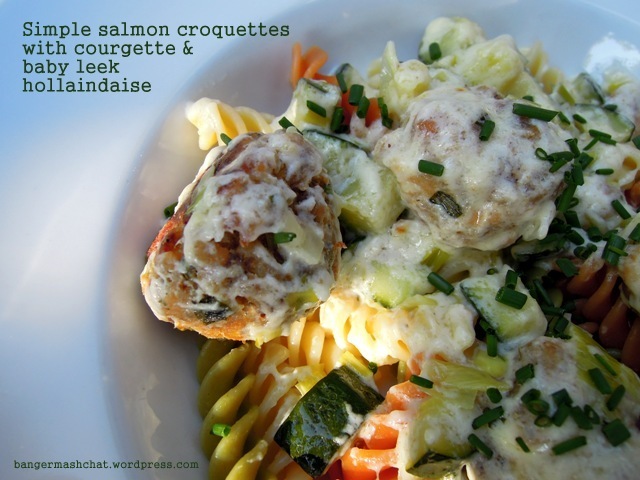 I served my croquettes with pasta and the hollandaise sauce combined with courgette and baby leek. Or you could simply serve the baked balls with dips as an appetizer, or perhaps with salad as an alternative to falafel for a tasty pitta bread filling. Drain the tinned salmon and flake into a mixing bowl. Combine with the spring onions, cream cheese, lemon juice, herbs and salt and pepper to taste. Using your hands shape the mixture into small balls and place on a baking sheet lined with greaseproof paper. Bake in the oven for 15 to 20 minutes until slightly browned. 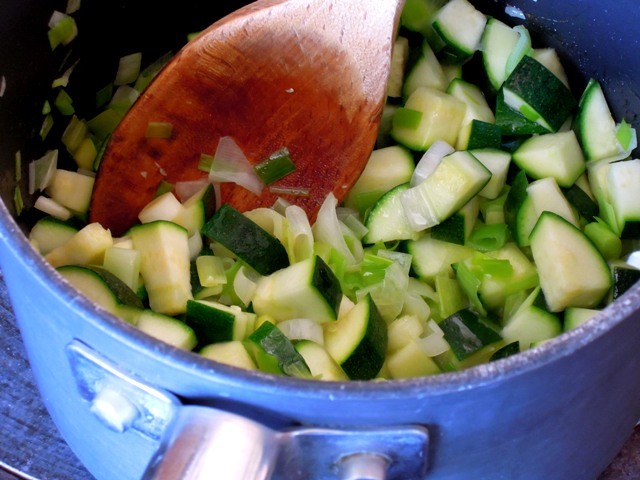 Meanwhile, prepare the sauce by gently frying the leek and courgette in the olive oil. When tender simply combine with the hollandaise sauce and heat through. Serve with your favourite pasta. You can either mix the croquettes into the sauce (being careful so as not to break them) or pop the croquettes onto your pasta and pour over the sauce. Finally garnish with some snipped chives. 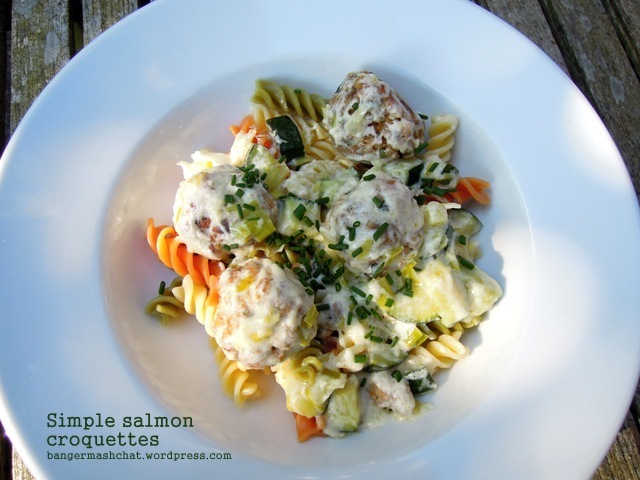 As this dish is so easy and uses the three key ingredients of salmon, courgette and pasta, I’m entering it into this month’s Recipes for Life challenge, which – as I’m sure you’ve gathered by now – I’m hosting on behalf of the incredibly fantastic charity SWALLOW. I absolutely love this post. The way it is written, the photographs and the recipe. Thank you! I have never made salmon croquette’s and it is about time. Thank you so much! They are incredibly easy and very popular in our house. Now THAT is original! Yum! Thank you – they are definitely yum! I’m reckoning my kids would love these too! They’re big fish fans (luckily) and love their meatballs. Had a few disasters with hollandaise so always a bit reluctant to make it now! Usually because of the kids calling me away for something ‘urgent’ and then it splits. That’s my excuse anyway!